Give homemade bread a go with this easy focaccia recipe. 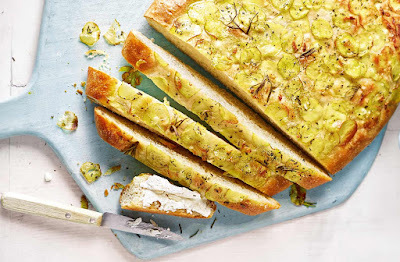 With a soft, springy center and crisp crust topped off with seasonal new potatoes, this fragrant focaccia is a summer winner. Pack up for picnics or serve as a sharing starter with olive oil for dipping. Pour the bread mix into a bowl, make a well in the middle and pour in 1 tsp oil and 320ml warm water. Quickly mix with a wooden spoon to a soft dough. Knead on a lightly floured surface for 10 mins until smooth and springy. Shape into a ball and put in a lightly greased bowl. Cover with a clean tea towel and leave in a warm place for 45 mins or until doubled in size. Meanwhile, boil the sliced potatoes for 5 mins. Drain well, leave to steam in the colander for a few mins, then dry thoroughly with kitchen paper. Gently mix the potatoes with the garlic, chopped rosemary leaves, 2 tsp oil and some seasoning. Tip the dough out onto a lightly oiled baking tray and use your hands to pull it out to an oval (about 30 x 25cm). Spoon the potatoes evenly over the top. Cover with a clean tea towel or loosely with lightly oiled clingfilm and leave in a warm place for 30 mins. Preheat the oven to gas 8, 230°C, fan 210°C. Dip your finger in a little oil and make a few indents in the dough, then push the rosemary sprigs into them. Sprinkle with the sea salt. Bake for 25-30 mins until golden and cooked through and it sounds hollow when tapped on the underside. If the bread is browning too quickly, cover with foil. Leave to cool for 15 mins, then drizzle with 1 tsp oil to serve. Tip: The focaccia is also delicious sliced and served with a sharp, creamy goat’s cheese.